“Take me to Saint Peter’s, please,” I asked the driver. And that is where he took me. I walked to the side of the basilica, which was enormous, but that’s not what concerned me. I told my name to the Spanish guide who was waiting and, with the three Peruvians, we entered the church through a small door and started to go downwards, so deep that I felt we were entering the very depths of the Earth. It is unbelievable how up-to-date the Vatican is. Automated glass doors opened and closed as we descended under Rome, and all you can see is dirt and archaeological digs, until we finally reached the level of an early Christian cemetery which bordered alongside one for idol worshippers. Everything around me was located three levels under the central square of Saint Peter’s, where hordes of pilgrims and tourists were walking at that very instant, but we couldn’t even hear them. It was absolutely silent in the vast emptiness of that place. It was truly breathtaking! In those little alleys that we were walking, completely covered by the Church overhead, beyond reaching the depths of the Earth, you also reach the depths of History. This is the core of Christian Rome, and it is from here that its voice is heard throughout the world. At some point, we went up a few steps and you can’t imagine what we saw! Saint Peter’s true grave, with his bones saved in a protective container made of plexiglass. The first Christians had built it here and it was spare, like the small structures you would see in any ordinary cemetery. Over this small structure, Constantine the Great had the first basilica built, the altar of which was directly over the grave. 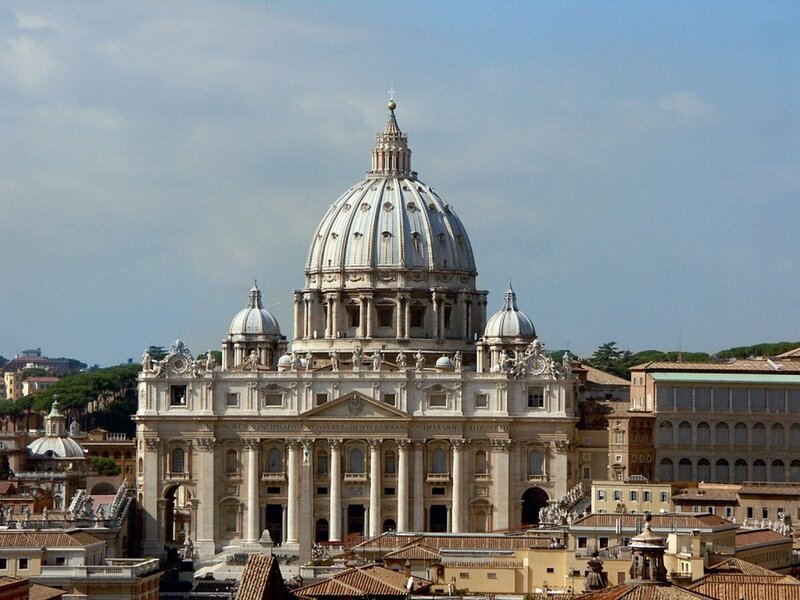 Over Constantine’s basilica, the structure we see today stands, with Bernini’s baldacchino located directly over the plexiglass-encased bones. As if guiding me, the voice inside me told me to thank the guide, who opened an iron door with some enormous keys and, leaving the depths of the earth, I ascended to the second level where I toured around the graves of the various Popes and, when I got up to the third level and saw the radiant majesty of the church, I was struck dumb. 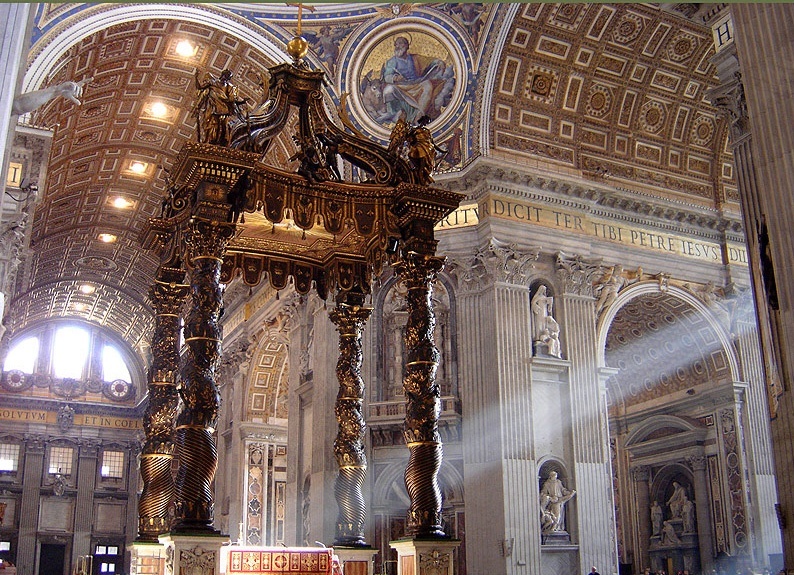 It was impossible for me to view Saint Peter’s like a church; I saw it as a museum. Especially after viewing the home of Simon Peter in Capernaum – you can imagine what a fisherman’s house that housed Christ for two years might look like – I found myself walking around slowly, observing the rich décor and I felt…what? It is so difficult to describe. It defies speech. I asked, but his voice was lost to me. Like a dream, he suddenly appeared before me as if in a vision, in a place in the Holy Land that I haven’t told you of yet. I was in one of the Hellenistic towns of the Middle East, known as Scythopolis, the only one now left in Israel and known as Bet Schean. It had once been a huge Hellenistic, Roman and Byzantine centre, built on the old commercial road between Mesopotamia and the Mediterranean. Naturally, the pilgrim inside of me awoke, along with my love for the Hellenistic East, but it was also a nice break from all the religious touring we had been doing. I was taken over by a romantic mood as I started to wander around the ruins. At some point, I went up to a semi-ruined Roman temple, and what I saw made me sit down on a fallen column. From up high, I could see the enormous pillars of the temple that had fallen to the ground because of an earthquake. This sight gave me a frightening feeling of catastrophe that was difficult to shake off. An intricately carved half-eagle had become stuck in the dirt during its fall. The same had happened to some Corinthian column capitals. These images took on an entirely new significance in the Holy Land. In my mind, I created a wind that shrieked and destroyed the world of idol worshipers, and then I let it die down over the caves and rocks of the various Christian sites we had visited that had no aesthetic significance. Then I called up the wind once more and, like a tornado, brought it here, to the basilica of Saint Peter, where I was walking, and I let it bring everything artistic and beautiful that the Eternal City has acquired over the centuries. Rome never did anything in a small way. Majesty was in its very breath. From the palaces of the Caesars to the mausoleums of its emperors, from the theatrical squares and baroque palaces, up to the highest point of Michelangelo’s famous dome that dominates the city.